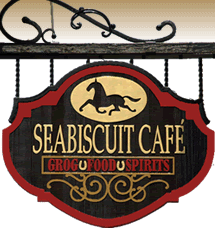 Seabiscuit Cafe is a Mackinac Island restaurant. Cozy exposed-brick walled pub in a restored 1880’s bank building. Sip a brew and dine on ginger chicken satay, Cuban sandwiches, and Mediterranean classics like gyros, fattoosh salad, and falafel.